SAPPHIRE Technology has just announced the SAPPHIRE HD 7770 Flex Edition, bringing together the highly acclaimed features of AMD’s GCN architecture with SAPPHIRE’s unique solution to multi-screen graphics in an affordable solution for the mainstream. 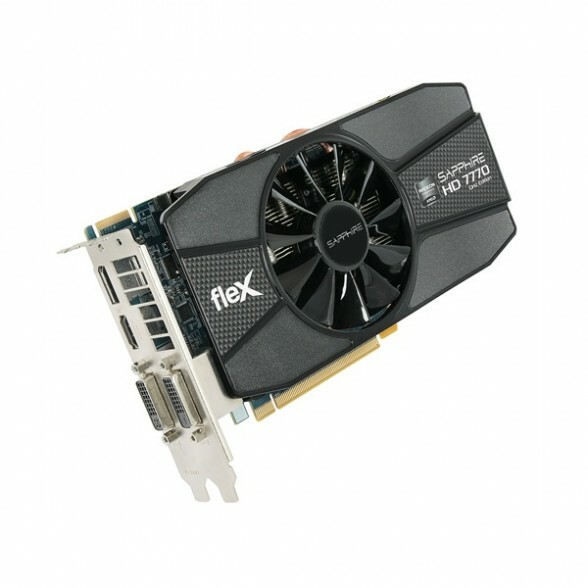 The SAPPHIRE HD 7770 FleX brings easily configured multi-screen graphics to the mainstream. The FleX feature enables users to connect low-cost DVI monitors for the first three screens in landscape or portrait mode providing a cost-effective solution for increased productivity in content creation and editing applications as well as for display systems or multi-screen gaming. By also using the DisplayPort output, the SAPPHIRE HD 7770 FleX can support four screens in Eyefinity, providing additional display options. The SAPPHIRE HD 7770 FleX is a member of the SAPPHIRE GHz series, and ships with clock speeds of 1000MHz for the core and 1125Mhz (4.5Gb/sec effective) for the 1GB of on board high speed DDR5 memory. For enthusiasts wishing to maximise performance, a new version of the SAPPHIRE overclocking tool, TriXX supporting this latest generation of technology is available free to download from the SAPPHIRE website. TriXX allows tuning of GPU voltage as well as core and memory clocks, whilst continuously displaying temperature. Manual control of fan speed is supported, as well as user created fan profiles and the ability to save up to four different performance settings. The HD 7000 series is the third generation of DirectX 11 compatible solutions from the graphics division of AMD – formerly ATI. The SAPPHIRE HD 7770 FleX is ready for DirectX 11.1 and the new Windows 8 operating system as well as delivering all the features of the current DirectX 11 such as DirectCompute11 and multi threaded communications with the CPU. Communication with the host PC is optimised with the implementation of the latest high speed PCI-Express Gen3.0 interface, and multiple cards can be used to further enhance performance in CrossFireX mode on a suitably specified mainboard. For more details about the Sapphire HD 7770 Flex Edition, check out the product page here.